No matter what anyone says, you can’t earn God’s love. His love for you is deeper, stronger, and wilder than anything you can imagine. No struggle, no lie, no self-message can change that truth. If you have trouble believing it, then hold on to your hat! 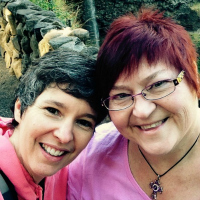 Guest Mary DeMuth is here to tell you all about that wild love—and identify the lies that keep you from embracing it. What does the deep mean to you? It means understanding that God is with you no matter what you are going through, and then cultivating the ability to see him in the dark times. God revealed to the Apostle Paul that he would have to suffer. A lot. God disciplines all those He loves, and He has a purpose and story for each of us. The thing is, we may not understand those things. There is a purpose in suffering, and the key for us to grow during those hard times is to be tenacious and cling to God in the midst of the difficulty. What makes you keep going when you’re in those deep places? The Sunday school answer is always Jesus, but I think it’s also choosing to reflect back on the goodness of God and to recount His faithfulness. It’s the ability to recognize when you are spiraling downward in your brain. At those times, every single bad thing can look 4,000 times worse and the blessings shrink because can’t see them. So we need to get our focus back on God. That changes everything. When did you first come to understand that you were wildly loved? That moment I met Jesus. But my understanding has continued to deepen. There have been valleys of misunderstanding and mountains of higher understanding. Jesus rescued me when I was 15 years old and ready to take my life. 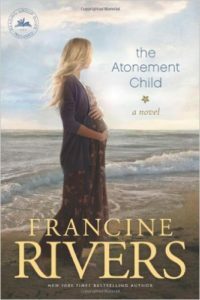 I had experienced sexual abuse, abandonment, divorces of parents, death of a parent, loneliness, and drug abuse in the home…so many crazy things! I would look down at my feet and think, Why I am occupying this space on earth? What is the point of me being here other than to be completely neglected or taken advantage of? Being a fatherless girl, losing my father when I was 10 years old, and then having several other fathers cycle through my life, I really didn’t come to Jesus with a sense of my sinfulness. It was more like I needed a father Who would never leave me. So when I met Him, that’s what He was to me. Talk a little bit about your book, Worth Living, and what motivated you to write it? That little girl who looked at her feet? She grew up, and she still struggles, still wonders why she’s here and what the point is and if God loves me. It’s a titanic struggle for me. One day a friend saw that I was believing a lot of lies about myself. She handed me these 3×5 cards that were bound together and told me to write the lies I was believing on one side, and then to pray and ask God to show me the Scripture that combatted the lie on the other side. It didn’t come right away. It’s not like you sit down and do this in one day. Even discerning the lies was very hard because I was so inside of myself. So I asked other friends and they were quick to say, “Well, you don’t think you are pretty.” Or, “You don’t think you are lovable. And you think you have to prove your worth by doing a bunch of stuff.” So that formed the framework of the book: Ten basic lies that women tend to believe, and ten truths that combat them. 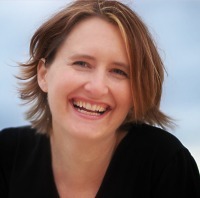 Go to marydemuth.com to print a free list of the 10 lies and the 10 truths to combat them. Is there any one of the lies that has tempted you to give up and say I’m done? That I have to prove my worth by doing a bunch of stuff. As a writer, I try to do all the right things, but I cannot control the sales of my book. I cannot control my success. That has been so hard. I’ve surrendered 7,898 times and I still have to do it today. It’s very frustrating. I have to continue to understand that God is not going to love me any less if I did 3 things on my to do list instead of 10 things on my to do list. No matter how many things we do, God loves us. If you are constantly trying to prove your worth, you will be on a treadmill of trying to gain approval. What signs are there to warn us that we’re trying to prove our worth? What have you caught yourself doing? It’s kind of a control and obsession issue. There can be an element of Phariseeism. You know, “Just give me the list. Tell me the things I’m supposed to do and I will do them.” But look at Jesus’s interactions with the Pharisees. They fell in love with the list, not with the Savior. When we try to prove our worth by doing a bunch of stuff, we miss Jesus. As writers, we need to hear His words and be compelled by them instead of being compelled to prove our worth. Micah 6:8: He has shown you, O mortal, what is good. And what does the Lord require of you? To act justly and to love mercy and to walk humbly with your God. What do you say to the person who is wrestling with the same things you wrestled with? With “I don’t feel my worth.” or “I don’t feel that God loves me”? First, realize that emotions cannot be trusted. My emotions may say God has abandoned me. I feel alone right now and I don’t like the struggle I’m walking through. But the truth is, God will never leave or forsake me. We need to base our lives on truth. When you are discouraged, what helps you? Community. If I’m in my head for too long, I get really crazy. Of course, I share that with the Lord and He does help me, but a lot of time I need God with skin on. To go out to coffee with someone and tell them how crazy I am, and have them tell me I’m not. That makes me feel a little better. A lot of times we get wounded in community, but I’ve realized that the way back is positive community. What is your final word of encouragement today? You are worth loving and your life is worth living. That is the crux of it all. 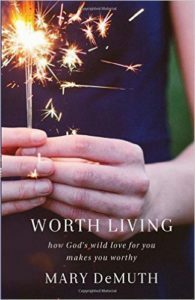 Mary’s publisher, Baker Books, has supplied 3 copies of Worth Living: How God’s Wild Love for You Makes You Worthy for a giveaway! Thank you Baker Books! You have to check our newsletter for details on how to enter the drawing! What Scripture verse helps you combat your biggest lie? Are you listening to lies about your worth? Don’t let emotions deceive you. What was James thinking when he told us to “count it all joy” when we encounter trials? How can trials and struggles bring us joy? Well, in a way you never imagined! The Bible is NOT telling us to be happy. Happiness and joy are two very different things. Happiness is temporary, joy is a foundation. Happiness is based on circumstances, joy is based on trust. “Pure joy, or “all joy,” is meant in terms of intensity—as in unalloyed or complete, and it’s not meant to be exclusive. James is not saying we should have no response other than joy. We’re not commanded to never be saddened by difficulties. But he is saying there is also occasion for this pure, unalloyed joy, a deeper joy, in the midst. The way to start finding this deeper joy is to fix our focus on God’s purpose for traumas and trials. Under the strain of trails, we get a clearer picture of our faith. It shows its true colors. And that’s a gift. 1. When we lose those things – our health, our job, our home – it helps us understand what we truly value…and what is secondary. So that’s part of the gift, part of the joy that James is talking about. These trials make us drill down into our values and learn what really matters to us. 2. Trials equip us to minister to others. They make us tender and gentle. The deep places we endure aren’t necessarily about us! God uses these times to refine us, to tenderize us, and to help us use our own experiences to help others. And that is another joy. We can rest in the truth that NOTHING is wasted with God. Not only that, but with every trial and struggle, we can know that God is going to use it to make us better able to minister to others. Together we all help each other. We uplift each other. This is the true community of suffering. That as we suffer, we are open and vulnerable and willing to let God use even this very deep place to love others. 3. The crucible of suffering produces endurance. The testing in these trials isn’t to see if we have faith, but to purify that which already exists. It’s the process of refining silver or gold, and that refining produces endurance. We learn to remain faithful to God over the long haul because of the difficulties we suffer. 4. Endurance produces spiritual integrity for us as believers. Not just for us personally, but for the community. We can’t forget that we’re not just a community of suffering, but we’re also a community that is the bride of Christ. While we suffer now, we need to remember where we’re going with all this. The end game is the bride being perfected and living eternally to glorify God. What can we do today to start considering it all joy? Step back and understand the point of it all. Take a breath. And don’t try to pretty it up. Be honest with God and with others about what you’re feeling and struggling with. Remember that it’s okay to struggle and sob. We’re not commanded to feel only joy. But we still need to keep the truth of God’s purpose tucked into our heart so that grief doesn’t turn to despair. Focus on the truth of God’s character. KNOW Him. With every doubt or spark of anger at Him, test it by sharing it with Him and with those you know will speak truth to you. Go ahead and feel your feelings…but don’t make the mistake of using those feelings as a basis for making decisions or deciding what is and isn’t true. You can’t trust feelings. But you can trust the foundation of biblical truth. Ask for God’s help in revealing His perspective of us as He refines us. God’s purposes will be achieved, but His way, not our way. He’s going to work His purpose in us, not our purpose. We aren’t meant to be comfortable in this life. This life is a shadow of things to come. Shadows aren’t made to be grasped. We can’t hold on so hard to what we think life should be that we miss the reality of what awaits. Be willing to share the truth of the deep place with others. They may seem, on the surface, to have it all together. But as often as not, those “not a care in the world” people are as raw and ragged as you, and they need to know they’re not alone. Have a question? A comment? A suggestion? We Want to Hear from You! What is your biggest struggle in counting your trials all joy? “Count it all joy” when you face trials? Who are we kidding?